What is the Environment Agency’s role? 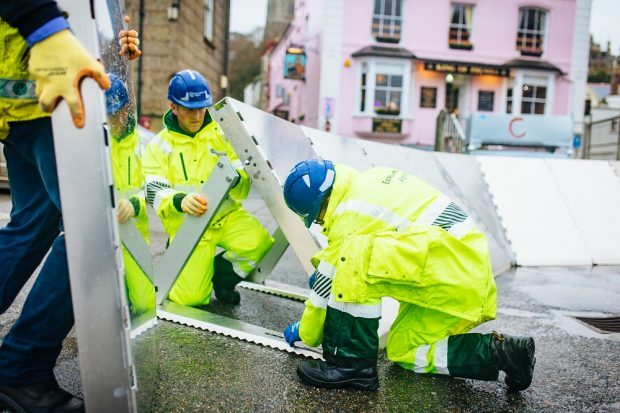 The Environment Agency shares responsibility for managing flood and coastal risk in England with many partners and organisations all of whom play a really important part. Our role is varied. We build and maintain flood schemes and we help those impacted by flooding directly or by working with those responsible for emergencies. We also warn, inform and respond when flooding occurs. But as well as this we are required to have a ‘strategic overview of all sources of flooding’. This means lots of things but it includes developing a plan of action for managing flooding and coastal change. We’re currently doing just that – looking out to 2050. A mammoth job! When we started the work late last year (2017) we decided to do it in a very different way. The strategy will give a long-term vision for all of those who have a part to play in managing flooding and coastal change. So it makes sense to involve those people in working out what it needs to say. Who’s going to understand the problems and spot the solutions better than the people working in the actual organisations who play a part? It also makes sense to listen to the voices of the communities who live with the fear and consequences of flooding. We’re now mid-way through a substantial process of collaboration and engagement. We’ve got around 150 people, representing 90 organisations involved in five separate working groups. We’ve also spoken to many more people from a variety of backgrounds. We are listening and taking on-board their visions for how we could collectively manage flooding and coastal change moving forward under the 25 Year Environment Plan. For me it’s a delight to be able to work in this way and an honour that so many people are giving up their time to get involved. If you want to know more about what we’re doing you can see our materials and contact us via the strategy website. It’s also slightly daunting thinking about the range of views we’ve heard. There are some common themes emerging: how we manage the increasing risk posed by climate change; how communities can get involved in decision making; how we work better with others (such as planners) making decisions about the places we live and work; and what the role of householders and businesses is in preparing for flooding. Tricky questions but the conversations we’re having are helping to make genuine progress. However on all of these there are diverging views. For me this is one of the biggest risks. My team and I have done all the text book things (I think…) to help us through this. We’ve been honest with those working with us about what they can and can’t influence. We’ve explained that legally this has to be an Environment Agency strategy approved by our Board, supported by Defra Ministers and laid before Parliament. We’ve also put an independently chaired Advisory Committee in place to help hold us to account and advise how we address those diverging views. Yet we know we can’t please everyone. As the Environment Agency has a stake in the debate ‘everyone’ might include us too! Quite a dilemma. People are giving up their time, investing their energy and emotion, and they might not get what they want included. There’s a risk that will lead to a more negative reaction than the disenfranchisement which comes from them never being asked. So how are we managing that risk? Good question! We’re keeping our engagement going for as long as we can. And even when we reach the end of our working groups it’ll be on to the next phase of engagement (formal consultation and then response) rather than a cliff edge. Plus we’re already thinking about engagement around implementation of the strategy too. My hope is that what we’re doing here is strengthening one big coalition of partners that will work together towards a common goal. We might not all think every word is perfect but if we can agree on the ambition for 2050, get behind the ideas for change, and hang our own individual plans beneath it, then I’ll count it as success. It is important to have a flood plan. Every country is susceptible to significant weather. I just read that Hurricane Florence may drop four feet of rain in the eastern U.S. (http://texasstormwatch.com/2018/09/hurricane-florence-impacting-north-carolina.html) It could certainly happen in the UK too. Are the Environment Agency writing a Plan or Strategy? If its a plan, then it will be constrained to work with existing legislation and organisational responsibilities. A Strategy though can, and should, look at different future needs including new tools such as legislation to help bring them about. A good strategy should have an inspiring vision which identifies what needs to be done to bring about change. Surely all the partners can agree on what should be in the vision. Come on Environment agency, show some leadership and convince your partners, and the government, that we need a strong and positive strategy, including significant money for investment, to equip the UK for dealing with long-term flood risk arising from climate change.